Just over two years ago, I was diagnosed with an extreme gluten intolerance. While we were already on a path toward more whole foods and less processed junk in our home, the diagnosis radically changed my life and the foods we have in the house. I spent a lot of time lamenting the loss of many of my favorite foods – crusty artisan breads, dumplings, pie, et cetera – and tried to find gluten-free substitutes. While there are good options out there for some of these, there’s just no substitute for real wheat, man. After about a year, my symptoms of being accidentally “gluten-ated” were decreasing, and now, I find that if I soak and/or sprout my wheat, the symptoms are nearly absent – pretty exciting stuff! Thus, this lesson from Wardeh has been a huge help to me, and I can’t wait to try some of the soaked/sprouted baked goods. 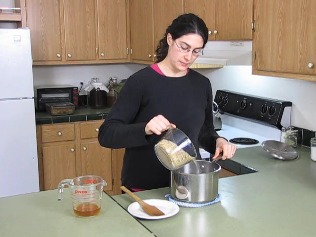 Wardeh begins the lesson by teaching us why soaking grains, seeds, and nuts is important. As I’ve noted before, non-religious folks can substitute “nature” for “God,” and still find value in her presentation. “God’s design for all seeds (whether grain, nuts, or what we usually think of as seeds, like pumpkin seeds) was for them to be stable until the time of germination. So he put some protective measures in place — these protective measures get in the way of nutrition or digestion. She enumerates two other important reasons, and then goes on to explain how soaking, sprouting, and fermenting helps to free up the nutrients and to reduce enzyme inhibitors. 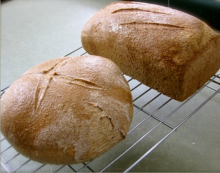 The third PDF, “Forms and Storage of Whole Grains,” is a quick overview of how best to store each form of grain – whole, cracked, rolled, flour. It is short, handy, and informative. Now that we have the historical perspective and some nutritional information, it’s time to actually get started in our own kitchens, yay! 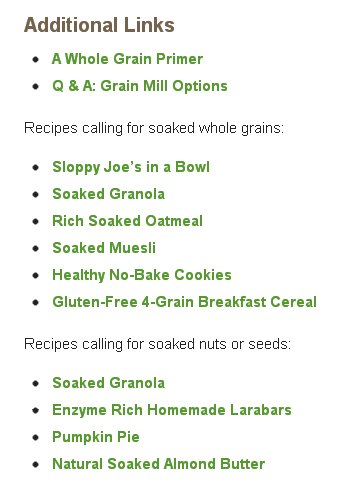 The fourth PDF, “Soaking and Cooking Whole Grains,” gets us into action. After going over why soaking is important in more detail, Wardeh provides us with our first recipe: Basic Brown Rice. In addition to giving us her favorite way to prepare rice, she also offers other options, and then ways to “take it further” with probiotically-active soaks and fermentation (souring.) 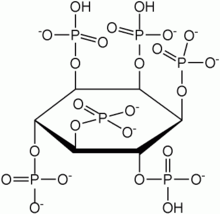 Wardeh also talks about the relative phytase levels in various grains (phytase being the enzyme which breaks down the gut-damaging phytic acid,) and how to boost low-phytase grains during the soaking period. Most of the high-phytase grains also have gluten; however, buckwheat is one good example of a gluten-free, high-phytase grain which may be used to boost lower-phytase grains, such as rice and oatmeal. Soaking grains does require thinking ahead. Typically, when I know what we’re having for dinner the next day (and thanks to the Plan to Eat website, that’s most days!) I’ll know I need to start a batch of rice or oatmeal soaking before bed. One of the many perks of soaking, though, as Wardeh points out, is a cooking time that can be reduced by half! Thus, three minutes of prep the night before saves me a good 20 minutes in the case of rice, and maybe 10 for oatmeal or other hot breakfast cereal. The fifth PDF in the lesson is a great Frequently Asked Questions sheet, in which Wardeh answers questions she’s received from readers. In the next PDF, we move on to soaking raw nuts and seeds. Before I learned how to soak nuts and seeds, I would sometimes get a stomach ache when I ate very many. With soaked versions, that’s never been the case! Too, the flavor of soaked nuts and seeds is phenomenal! Nuts in particular get a very buttery, rich taste we absolutely love. Why soak raw nuts and seeds? Soaking and then dehydrating nuts and seeds takes quite a bit of time – up to 24 hours for the salt water soak, and then possibly another 24 hours to get them dehydrated again. This is a nearly entirely passive process, though, if we have a dehydrator in the kitchen. I use a pretty cheap Nesco dehydrator, and it takes about 24 hours to dehydrate large nuts like almonds and cashews. 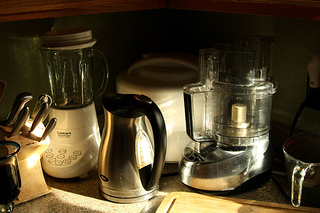 Those with Excalibur (or similar) dehydrators will likely require less time. Wardeh’s Soaking Raw Nuts & Seeds PDF gives readers all the tools we need to make delicious, nutritious, non-stomach-ache-inducing treats for snacks, baking, or for anything else we’d use “regular” nuts. She also talks about storing nuts; which are stable at room temperature, and which should be refrigerated. This PDF is followed up with another FAQ, covering questions her students have come up with over time about soaking nuts and seeds. It’s worth noting that roasted or otherwise cooked nuts and seeds will not benefit from soaking – their enzymes have already been obliterated by the heat. Additionally, those “raw” cashews you’ll find in 99% of stores are not raw; read this article to find out why. 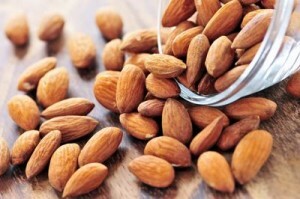 Finally, be careful where you source your raw almonds – they may be coated in a jet fuel additive! Nope, I’m not kidding. 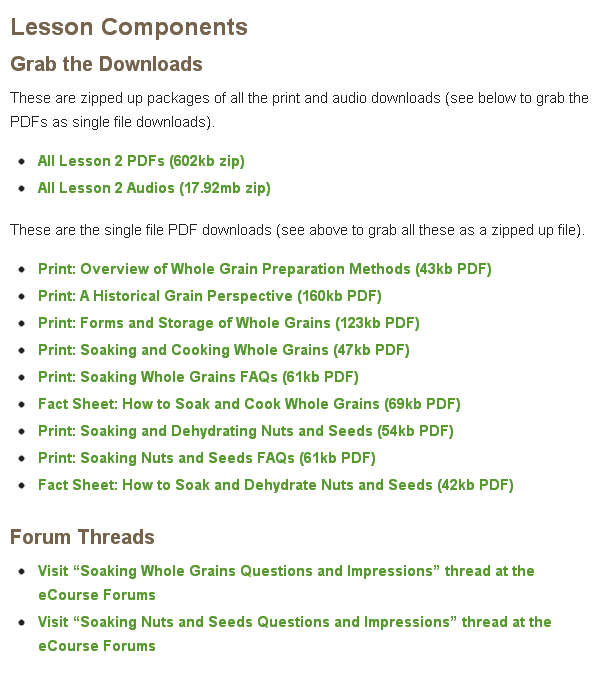 The final PDF in this lesson is a soaking raw nuts and seeds Fact Sheet, which sums everything up nicely. The first three media files go over much the same information as the printed material; however, if you’re anything like me, you might learn more when the information is presented in a variety of formats. We all learn differently; some folks do better when they read, others when they hear, yet others when they do. Wardeh’s lesson formats ensure everyone has the information they need to best learn the information presented. This is a really huge benefit; so often, classes are only provided in a format some of us have a difficult time with. In the second video, Wardeh demonstrates the brown basmati rice recipe in her own (enviably clean) kitchen. Her instructions are clear and easy to follow, and she adds helpful information and methods along the way. The quality of the video and sound is excellent. Wardeh does the videos without notes (at least without visible notes) and clearly has a vast amount of knowledge about the subjects stored in her head. 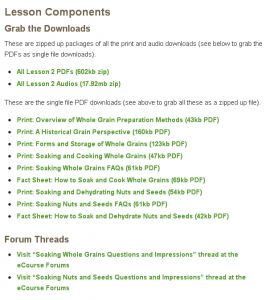 The Soaking Whole Grains, Nuts & Seeds lesson is a great starting place for those new to the WAPF school of nutrition, or those new to whole/real foods in general. It provides a fantastic overview of why soaking is important, gives us historical and nutritional context, and offers foundation recipes which we’ll use in multitudinous meals in the future. Thus far, I’m very impressed with the quality of Wardeh’s presentations, and with how easy they are to follow along with! 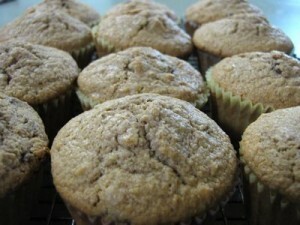 Next up: Soaked Whole Grain Baked Goods!